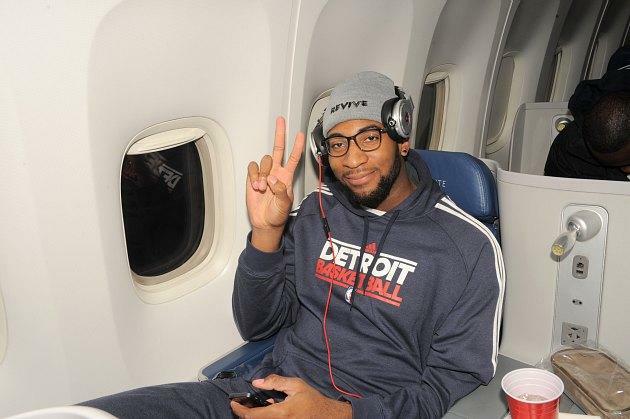 On Friday, NBA superfans got some very bad news: Detroit Pistons rookie big man Andre Drummond, one of the most dynamic players in the league, will miss at least a month with a stress fracture in his back. It's a stone-cold bummer not just for the Pistons and Drummond, a potential force in the paint, but for anyone who enjoys seeing a uniquely gifted player do things that no one else can do. Drummond is still developing and not particularly consistent, but he's the sort of talent who demands attention. The Drummond drum beat served two purposes. It is helping his sore back get better and it also is a way for Drummond to keep connected with his team. He will be with teammates every day during his rehabilitation. Step one was beating on a drum that he carried with him throughout the game-day practice. The idea is to strengthen his core by keeping his back straight while he taps on the drums. Drummond injured his back last week and is expected out four to six weeks. "He is our Ringo Starr," Pistons coach Lawrence Frank said. "I think it is very important that when you are injured in all professional sports to remain engaged. Sometimes in sports when you are injured, you become invisible. I think it is important that we integrate him in everything we do and he integrates himself. Mentally you are preparing like you are playing, but physically you can't play. So you prepare yourself as best you can." I don't know if playing the drums actually has medical benefits that other forms of rehabilitation don't, but it seems like a very good idea for the Pistons to integrate Drummond into as many of their daily activities as possible. He's going to be a major part of the franchise moving forward, and it's best if he becomes acclimated to the responsibilities of that role. Ideally, that would happen on the court, particularly while playing with other important players like fellow big man Greg Monroe. However, if that's not possible, then spending time at practices working with teammates — or just keeping the beat for them — is the next best option. Plus, if Drummond has to sit for an extended period of time, he can develop a new skill. Maybe he can even get in touch with accomplished pianist Kobe Bryant and try to start a band.